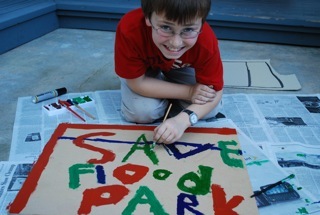 The City of Menlo Park needs Flood Park to reopen and welcome back our city’s children and seniors. Can you imagine pushing your stroller up to your neighborhood park only to find it fenced in and the gates chained shut? This is the predicament for Menlo Park families living near Bay Road. Water pipeline repairs required that the Flood Park be fenced in and shut for the past year to house the equipment and supplies for workers. However, San Mateo County budget woes have led county staff and supervisors to state publicly that Flood Park will remain closed indefinitely after the water pipeline repairs are completed and the work crews and all their gear disappear from the park in September. San Mateo County budget woes have resulted in county staff recommending the closure of Flood Park in Menlo Park. The County currently spends approximately $205,000 annually at Flood Park after accounting for the revenue from parking fees and picnic site rentals. Although residents understand the county’s budget troubles, we cannot stand by and let county budget woes shutter this pedestrian friendly park and lock out residents indefinitely. In early April, 100 residents near Bay Road meet together to show city and county staff their support for Flood Park. Out of this meeting grew a grassroots movement to save the park. Members of the new group, SaveFloodPark, have spoken with San Mateo County and Menlo Park City staff about the possible transfer of Flood Park to the City of Menlo Park. Currently, the City of Menlo Park is reviewing information about the finances and operation of Flood Park provided by the county. The city is using this information to form a point of view about whether the City of Menlo Park should take over ownership of the park form the county. 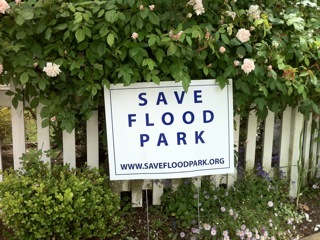 SaveFloodPark supports either the reopening the park by the county or the selling of Flood Park to the city of Menlo Park for $1. In fact, we are in the process of forming a new nonprofit organization, Friends of Flood Park, to recruit volunteers, collect donations and provide ongoing support for Flood Park once it is reopened. Flood Park is one of the Menlo Park’s valued open spaces spreading out over 21 acres and hosting 75,000 visitors annually (according to county staff). Menlo Park’s lush trees, highly rated schools and wonderful parks are all reasons that residents choose to live here. Please help us reopen one of our Menlo Park city’s largest parks which serves as a 21 acre refuge for Menlo Park families and adults living in stress filled Silicon Valley. Please join the 80 plus residents who have written the Menlo Park City council in support of Flood Park by sending an email to [email protected] You can also show your support by visiting our website or joining the 500 plus folks who have “friended” us on Facebook. Thanks for your “Flood” of support!